I had no idea how much I wanted an RPG to let me do this until now. Xenoblade Chronicles X is not an easy game to navigate. It is simply massive and can take hours to run across. More than that, even with waypoints, it’s common to find an unclimbable mountain or area full of high-level monsters between you and where you want to go. The game also has a lot of vertical depth—meaning you will often find yourself at the bottom of a canyon, unable to see the terrain beyond the cliff walls. And while the mini-map and its topographical information help (for those who can read topographical maps anyway), it shows far too limited of an area in many cases. The game pad’s world map, on the other hand, is not detailed enough. Luckily, there is another option, and it’s perfect. 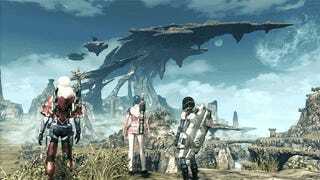 At any time out of battle in Xenoblade Chronicles X, you can launch a remote camera high into the air—allowing you to see not only the surrounding terrain but nearby aliens and wildlife as well. Once in the sky, you can take control of the camera and rotate it to search for paths or waypoints. Of course, I find myself launching the camera constantly—not just to help me get around, put also to check out the game’s amazingly beautiful scenery from a bird’s-eye view. True, it’s just a tiny feature in the overall game, but one that I am already in love with. Xenoblade Chronicles X was released in Japan on April 29, 2015, for the Wii U. It will be released in the West sometime in 2015.